Our modern and environmentally friendly means of transport park contains 30 tractors and 35 semitrailers of different types. 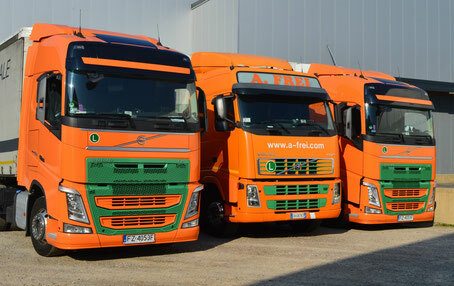 Thanks to them A. Frei Logistics company may meet customers’ requirements at any time, also the company may complete transport orders in flexible and reliable way. Thanks to the thorough maintenance of vehicles, which we conduct in our workshop, our fleet is always presented in a perfect condition. A perfect technical condition of our vehicles with low fumes emission is on the most modern level, and our satellite connection allows real time location and precise following of the transported goods. All units are equipped with Europalettes and guarantee undisturbed exchange at a given leader.